Invite a friend to practice, on you. . . or even better, on us! Thanks for being such a great part of our community. We'd like to give you $30 to spend on any one of our yoga class packages or towards your next membership fee. The organic juice contains kale, collard greens, green chard, spinach, as well as a bit of apple to sweeten it. The drink contains zero preservatives and may yield results such as increased energy and weight loss. 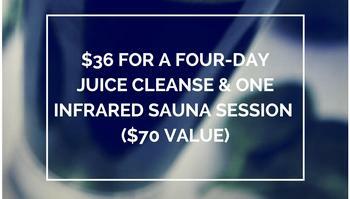 Infrared saunas supplement the juice cleanse’s purifying process with detox sessions that burn calories. During the sessions, clients can sleep, meditate, or listen to portable music devices.